The Ryobi 3200 MCS is a fully featured, convenience console offset printing press designed specifically for top quality reproduction. 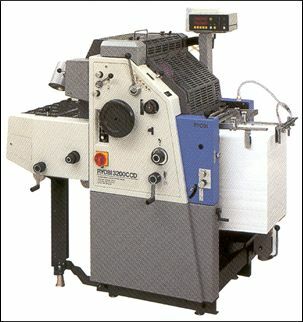 The 3200 MCS offset press performs reliably on large solids, screens, halftones and more difficult spot color work. More impressive is the way it allows tight registration of multi-color work. It makes short work of even the toughest jobs. With the Super T-Head the 3200 MCS becomes a two-color press offering hairline registration in multicolor applications and increased productivity to ensure that jobs are done accurately and on time.